To me (the parent of twin toddlers) the absolute luxury, the be all and end all, the ultimate treat is a day at the spa! OK, maybe an overnight stay at a spa hotel, but a spa day comes second best. When my friend text me to see if I fancied a spa day I immediately said yes and we started looking for deals and inspiration. Neither of us had visited the Serenity Spa at Seaham Hall before and we found a great midweek deal, including a massage or facial and two course lunch for £85. A spa selfie... A spelfie? We arrived at the spa just before 10am to have our treatments first. The staff were professional and welcoming and served us a cold drink while we registered. We were given a tour of the facilities before being encouraged to relax in the Zen Lounge and await our treatments. The Zen Lounge featured reclining, heated chairs, magazines, water and herbal tea. It was soon time to go to one of the treatment rooms, all of which had a shower and toilet and were tranquil and beautifully finished. Honestly, much less like a disco in real life! I had the 50 minute Serenity Wellbeing Massage; a full body massage, with a little extra attention to the knots in my back, as requested. It was a lovely treatment and I didn’t want it to end. My friend opted for the skin specific facial and really enjoyed the products used. After the treatment we returned to the Zen Lounge for a fruit plate before heading to the spa. We were able to get a lounger by the pool; the staff keep an eye out to ensure the loungers don’t get reserved by people for too long. We flicked through some magazines for a while before trying out the facilities. I really liked how many facilities the spa had to offer including inside and outside hot tubs, steam room, sauna, sanarium, hammam, ice pools (avoided!) and warm swimming pool. We headed to the Ozone restaurant for a Pan Asian lunch, upgrading to the full three courses (obvs!) and a glass of wine. The food was delicious, and they brought us a bowl of prawn crackers to stave off the hunger while we waited. We both had the duck pancakes, then I had a delicious steamed sea bass, with pak choi and noodles, and my friend had oyster chicken. We finished with an Eton Mess and coconut panna cotta. We ventured into the outdoor hot tub after lunch and after a slow lap of the pool (post-lunch swimming was difficult) and another relax on the heated beds it was time to go home. Nooooooooooooooooo!!!!!!! The day flew over and we were tempted to forget the kids and book a room! I can’t recommend the spa enough. The whole experience was effortless and professional. The Spa and Hotel were refurbished in 2012 and the facilities were clean and well maintained. The changing rooms were stocked with towels and robes and the were lots of staff on hand keeping the place immaculate. I think I’ve found my new favourite North East Spa (I still love you Rockliffe, but you are a bit further from home!) and I can’t wait until the next time we can fit in a spa day. I like to think I’m a crafty person. I’ve had a go at card making, cushion making and even had a stab at a pair of curtains, but I do find it hard to schedule craft time into my life these days, so I was thrilled to be invited to Hillarys Crafternoon last Saturday. Every two years, Hillarys Blinds introduce a new range of fabrics for their curtains and blinds and have recently introduced new gorgeous, quality fabrics. They decided to challenge bloggers in four cities across the country to get creative and use their fabrics in ways beyond the usual scope. They enlisted the help of the Clare and Hannah from The Crafty Hen who provided inspiration and direction. 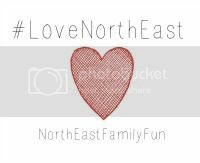 I attended the Crafternoon in Newcastle, held at the iconic Jazz Cafe, and was looking forward to meeting fellow bloggers and to all the crafty fun planned. We enjoyed tea and biscuits while we met the lovely people from Hillarys and the Crafty Hen, and were given a run through of the activities planned. There was a bit of nervous excitement amongst the bloggers and when we were invited to select our fabrics, there was a definite hint of Great British Sewing Bee, as we picked enthusiastically! First of all we made embellished covers for notebooks, that were designed to be removable and reusable. We had a number of fabrics and embellishments to choose from as well and needle and thread, and glue guns. I chose this beautiful green fabric and some simple buttons and ribbon and was really pleased with the outcome. Now… not so successful (for me! ), but still very enjoyable was a little 3D bird. This was a little more challenging, and I stitched a little too close to the seams so the poor bird kept bursting his sides and needed a bit of reconstruction along the way. It was quite therapeutic actually, especially the hand sewing, and I saved the template so that I could have another go at home. New Girl in Toon, Chloe, overcoming her craft fear with a glue gun! It really was lovely to spend an afternoon doing something a little different, with the gorgeous fabrics, and to see how everyone interpreted the notebook covers so differently. We received a goody bag at the end (who doesn’t love a goody bag?!) including of a tote made from one of the new fabrics. You can read Hillarys blog post about the craft roadshow here on their website. If you are a bride-to-be or hen-to-be, you should definitely check out The Crafty Hen, for something fun to do on your hen weekend! And thank you to Joe Blogs for bringing us all together for this event. Very proud of our creations!